The basic questions when building an antenna are which size and how many turns. As usual, "the bigger, the better" is a mis-conception and the Laws of Nature are not that simple. As explained in the antenna theory page, bigger antennas and more turns means increased signal level at the output of the antenna. But this also means increased noise. This page should help you in finding the optimal antenna characteristics for your application. Firstly, it contains an analysis of the antenna noise, with a characterization of its influence with respect to the natural or man-made radio noise expected at VLF. Then, the section Signal-to-Noise ratio is a synthesis of calculation of SNR for various antenna sizes and frequencies of interest. the radio noise, whether natural or man-made. the noise of the antenna itself. We have no influence on the radio noise, we can just install the antenna in a place as quiet as possible, that is away from EMI sources. But we can try and minimize the noise of the antenna and its preamplifier in order to reduce it to levels lower than the radio noise. The radio noise is described in the P.372 recommendation of the ITU. It is modelled in the radio noise page. The resistances are the main antenna noise sources. Each resistance is a source of white thermal noise. The power spectral density of this noise does not depend of the frequency. The noise generated by a resistance is: (Johnson-Nyquist formula). vnoise is the noise voltage spectral density, in V/Hz½, k is the Boltzmann constant (1.38·10-23 J/K), T is the absolute temperature in kelvins, and R is the resistance value in Ω. By using copper wire with an important cross section, it is possible to reduce the wire resistance as well as the high frequency resistance. The current plots show the current noise spectral density, in A/Hz½. Those values are obtained by adding at the output of the antenna an ideal operational amplifier acting as a current-to-voltage converter with a noiseless transresistance of 1Ω. The noise voltage spectral density calculated by SPICE at the output of the converter reflect the current noise spectral density at the shorted outputs of the antenna. The green line corresponds to the noise of the antenna only. The blue solid line corresponds to the sum of the maximum expected radio noise and of the antenna noise. The blue dotted line corresponds to the maximum expected radio noise only. The cyan solid line corresponds to the sum of the minimum expected radio noise and of the antenna noise. The cyan dotted line corresponds to the minimum expected radio noise only. We see that, in both voltage and current analysis, the noise contribution of the antenna gets preponderant on the radio noise only below about 70Hz for maximum radio noise conditions, and below about 6kHz for ideal radio noise conditions. 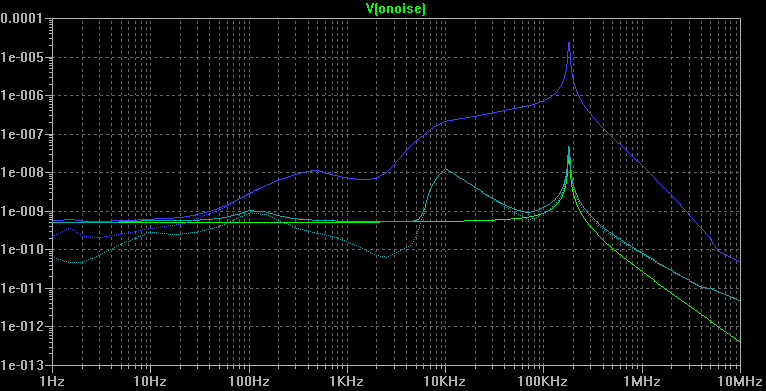 In this case, the antenna noise is not significant for VLF waves reception. This would not be the case for the reception of ULF, SLF or ELF waves. 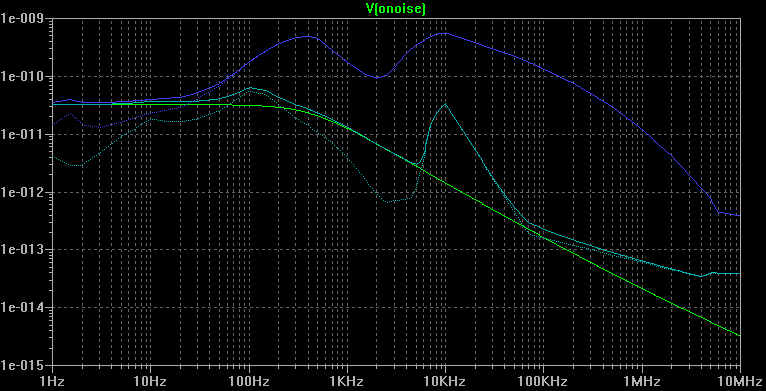 The noise of the antenna (and of its preamplifier) is a significant parameter to take care of. It should be lower than the expected radio noise in the frequency band of interest. Resistances are a major source of noise in the antenna. They can be minimized by using copper wire of important cross-section. A low resistance both allows to reduce to lower frequencies of the linearity range of the antenna and to limit the thermal noise. The antenna dimensions have to be sufficient to generate signal levels high enough with respect to the sensibility of the receiver. Under those circumstances, the most important parameter to take into account is the signal-to-noise ratio. The higher, the more easily useful faint signals can be extracted from the background noise. This section contains the SNR values determined by SPICE simulations of square loop antennas of various sizes and number of turns. The model used here corresponds to a non-tuned antenna working in current. 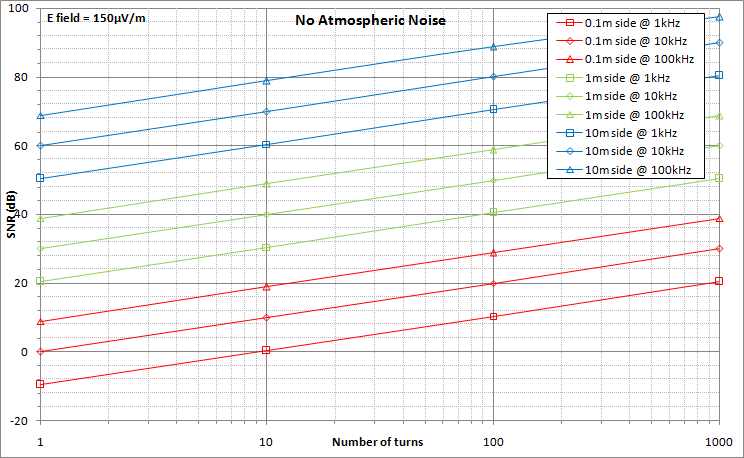 The three graphs here below show the SNR values (vertical axis, in dB) against the number of turns (horizontal axis). Plots for antenna sizes of 0.1m by 0.1m (4" by 4"), 1m by 1m (3.3ft by 3.3ft) and 10m by 10m (33ft by 33ft) are shown. The calculations have been made for a electric field of 150 µV/m at the antenna, which is a reasonnably moderate signal level. a tenfold increase in the antenna size corresponds to a gain of 30dB on the SNR. Basically, the signal increases by 40dB (signal voltage is proportional to the antenna area, and so to the square of the size) and the noise increases by 10dB (thermal noise voltage is proportional to the square root of the wire resistance, and so to the square root of the wire length). 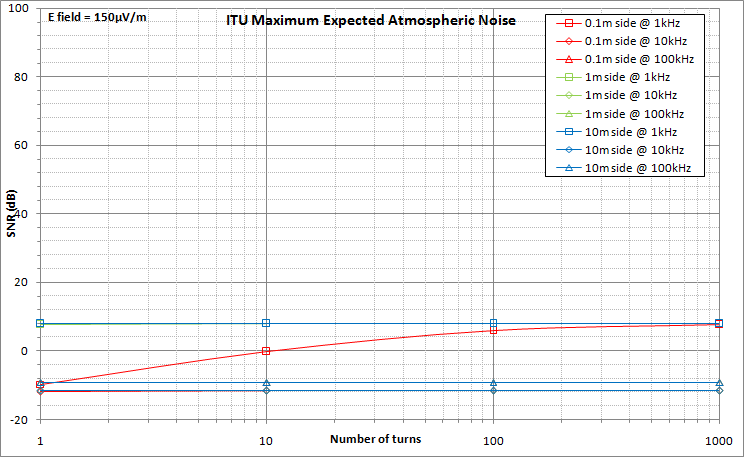 a tenfold increase in the number of turns corresponds to a gain of 10dB on the SNR. Basically, the signal increases by 20dB (signal voltage is proportional to the wire length) and the noise increases by 10dB (thermal noise voltage is proportional to the square root of the wire resistance, and so to the square root of the wire length). 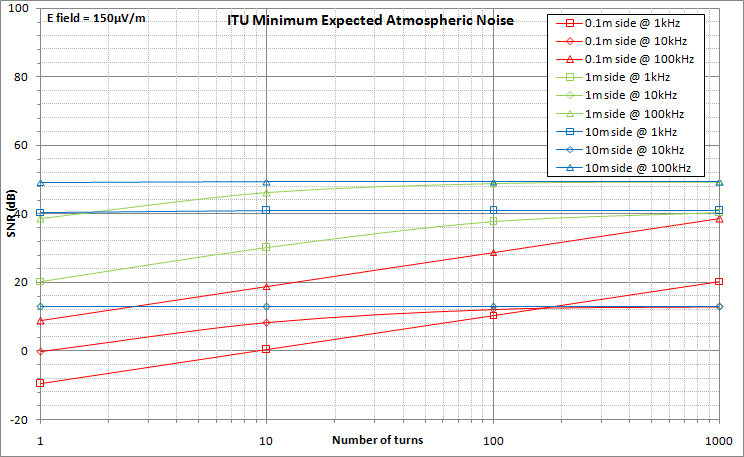 The second graph corresponds to actual conditions where the radio noise is minimal. To reach those noise levels, the best possible location must be chosen (away from man-made noises) and atmospheric noise must be low. Even under those excellent circumstances, one can see that the antenna efficiency with respect to SNR gets non linear with respect to size or number or turns. For a "big" antenna (10m side), the number of turns has no effect at all, so a single turn antenna is sufficient, for all frequencies of interest. For an antenna with a side of 1m, the influence of the number of turns gets marginal above a few tens of turns. The last graph corresponds to worst case conditions of radio noise. In this case, the influence of the antenna characteristics on its overall capability to extract useful signal from the overwhelming noise is quite limited. The SNR is the main factor to take into account when sizing an antenna. Depending on the frequencies of interest, a trade-off has to be made between the antenna capability to extract useful signal buried in noise and the practicability constraints. To take benefit of best possible external conditions, one should consider using the minimum expected radio noise as a baseline. Under those circumstances, it is important to have in mind that increasing antenna size or adding more turns does not necessarily means improving the capability of the antenna to pick up faint signals. The graphs above should help you finding the best combination of antenna dimensions and number of turns according to your needs.